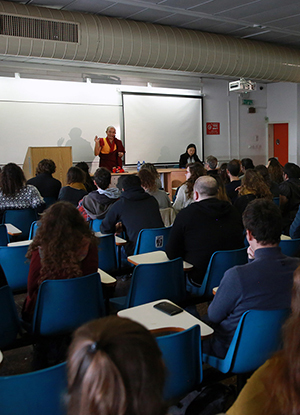 In his talk at the Hebrew University in Jerusalem, Khenpo Sodargye expounds on the law of cause and effect, reincarnation and karma. 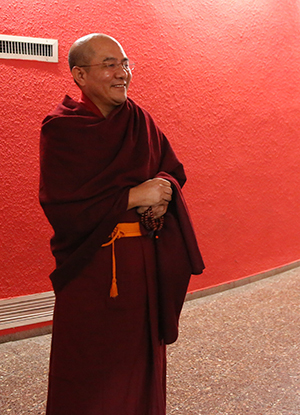 Khenpo uses the example of his spiritual teacher His Holiness Jigme Phuntsok Rinpoche to point out the continuity of life through reincarnation. At the end of his talk, Khenpo offers two suggestions: that everyone should adopt the code of doing good not evil and be of a compassionate and benevolent mind in doing everything, including the academic research. If the Karmic Law Is True, We Must Pay Attention to It. I believe the law of cause and effect and the existence of reincarnation are not purely religious. They are not like religious rituals or sadhanas such as prayer and meditation that are practiced only by some and are not applied to all humans and animals. If the formation of our lives truly depends on various complex and diversified causes and conditions, we should pay attention to it—the law of cause and effect. According to the Discourse on the Stages of Yogic Practice, “the karmic fruit of our actions will not vanish and what we have not done will not bear fruit.” This means the karma resulting from completed actions is imperishable and that we won’t be affected by actions that have not been taken. This is an important yet subtle point in terms of cause and effect. For two decades I was one of His Holiness Jigme Phuntsok Rinpoche’s closest attending students. During my contact with him, as well as what I saw and heard, what impressed me the most was the consecution of his life. People all over the world have life consecutions. It’s just that, according to Buddhism, many of us can’t recall our past lives. Our memory is disturbed by the disruption of rebirth. However, there are a few people who can recall their past lives. The Buddhist Academy where I currently reside was founded by His Late Holiness Jigme Phuntsok Rinpoche. It is one of the largest academies of its kind in the world. All the practitioners there believe in the karmic law of cause and effect and the existence of past and future lives. Although H. H. Jigme Phuntsok Rinpoche has departed from us, he endowed us with this full-scale Buddhist Academy. This is the place where I have lived and studied and still study. Let’s look at a short video now of Larung Gar Buddhist Academy as it is today.